Are You Comparing Apples to Apples? With the tremendous range of feeds and supplements available, how do you even begin to select the right ones for the horses in your stable? If you have ever wanted to ask those questions, read on. I’ll try to give you some tools to sort out the wheat from the chaff. Just like the horsemen who ask me about new products they have come across, I can’t always answer those questions immediately. I have to follow a process to objectively evaluate them. I’ll get to that next. Back in 1999-2000 or so, I started looking at oral pastes and powders as a practical, economical alternative to the more invasive and expensive pre-race treatments I used to give my patients. (My “loaded amino acid jug” was a Duphalyte or Amino Plus with 30cc’s CaCo Copper, 10cc’s Hemo 15, and 10cc Hippiron, with or without vitamin B12 and vitamin C, given iv along with folic acid given im. 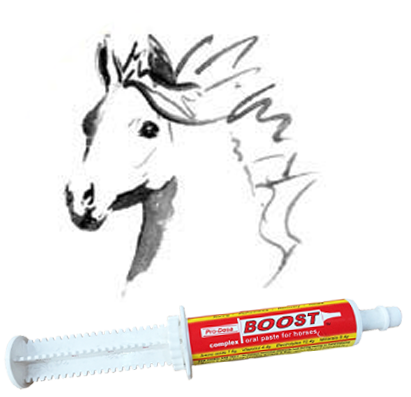 Some of my clients liked to have their horses tubed with electrolytes and given Co-Forta injections instead). quantified with different units of measure (mg/kg, %, ppm, to name only a few). Then, they were to be given in different doses. The most confusing paste I found listed contents in terms of parts per million (ppm), percentages, and mg/kg. Then, the syringe was in pounds and the recommended dose in ounces. OMG!!! Clear as mud!!! What I was beginning to wonder, was that if some companies don’t actually want you to know how much or little of each nutrient is in their product. Standing in the feed store, it was nearly impossible to do all of the mental gymnastics required to evaluate and compare the products available. So, I did what you must do if you want to fairly compare apples to apples rather than apples to oranges. I made a list of label information and recommended feeding rates. Then, before I could really compare supplements, I had to go home with my lists of label information, sit down with a calculator or spreadsheet (…and a wine…or a latte…), look up conversion factors, and look up nutrient requirements. Here is a link to my basic spread sheet that you are welcome to copy rather than typing all the nutrients into your own. Enter or write down the contents as listed on the label, including the units. Are the quantities listed in micrograms (mcg or ug), milligrams (mg), grams (g), kilograms (kg), parts per million (ppm), percentages (%), international units (iu), or 1000-international units (kiu or IU)? Are those quantities listed per kg, pound,or dose of the product in question? In this example, Arginine is listed as 0.31%, Iron is 3500 ppm, Vitamin B12 is 1013mcg/lb, and Thiamine is 992mg/lb. (…No, it doesn’t make much sense to me either…Yes, stop now and go get that glass of wine!) Here’s where we will start to make some sense of this stuff. You will need to convert all the units to milligrams per gram (mg/g) or whatever units you understand. (In NZ, we use the metric system.) I generally convert everything to mg/g, as I have entered the nutrient requirements into my spread sheet in milligrams (mg) (more on that later), and the dose of product you will give your horse will mostly be measured in grams (g). You can use the conversion factors here or google each nutrient. A percentage, as you know, is a number out of 100, so a percentage is the same as an amount in milligrams per 100 milligrams or the amount in grams per 100 grams or the amount in peaches per 100 peaches. Make sense? Then, there are 1000 milligrams (mg) per gram (g), so we have to multiply the amount per 100 mg by 10 to get the amount per gram. OK, in this example, Arginine is listed as 0.31% so that means there is 0.31mg per 100 mg. We multiply this by 10 to get 3.1mg of Arginine per gram of paste. Parts per million (ppm), using the peach analogy, is the amount in peaches per 1 million peaches. So that is the same as the amount in micrograms per gram. There are 1000 micrograms (mcg) per 1 milligram, and there are 1000 milligrams in a gram, so there are 1 million micrograms in a gram. Anything listed in ppm, therefore, can automatically written instead as mcg/g. We, of course, are working towards having everything in mg/g, so divide the amount in ppm by 1000 to get the amount in mg/g. In this example, the Iron is listed as 3500ppm. That’s the same as 3500 mcg/g. If we divide by 1000 to get mg/g, there is suddenly only 3.5mg/g. That doesn’t sound like nearly as much. As we learned before, there are 1000 micrograms (mcg) per 1 milligram. Divide the amount in micrograms by 1000 to convert to mg. In this example, Vitamin B12 is actually 1.013mg/lb. Easy! Whoa! Not so fast. That’s 1.013 milligrams per pound. Now I didn’t grow up with the imperial system, so I had to think about that one. There are 2.2 pounds per kilogram, and there are 1000 grams in each kilogram. First multiply by 2.2 to find out how many milligrams are in a kilogram (1.013 x 2.2 = 2.23mg per kilogram) and then divide by 1000 to find out how many mg are in a gram. It turns out, there are 0.00223 mg/g. Thiamine (Vitamin B1) is already in mg…thank you very much!! However, it is also listed per pound, so as we learned above, multiply by 2.2 and divide by 1000. You can fill in Thiamine on your spreadsheet as 2.18mg/g. You can then just repeat this process for everything listed on the label. There are a few conversions that I haven’t included here. International Units (iu) are frequently used as a unit of measure for vitamins, medications, hormones, and other biologically active substances. These are different for every form of vitamin as they include a measurement of effectiveness or biological activity. I have to look the conversion factors up every time I have to use them, and the best place to find them is on Google. So you don’t have to, here are a few of the main ones. Convert the contents per kg, L, g, oz, or pound to the content per dose. If you have converted the contents to mg/g and the dose is in grams, just multiply your quantity in mg/g by the dose. If you have converted to mg/kg, then multiply your quantity by the dose and divide by 1000. (There are 1000 grams per kg). We have already calculated the contents in mg per g, so we just have to work out how many grams are in our dose and multiply by that number. In this example, there are 68 grams (1 full syringe) per dose. Write down the nutrient requirements for your particular horse, at the specific level of work and stress they are under. In my spread sheet, I have included the requirements for a 450 kg horse in intense work. 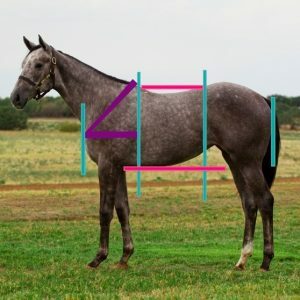 Those requirements will work fine for a Standardbred at 400-450 kg, a flat racehorse at 500-550 kg, or a sport horse at 550-600kg, but you can look up the precise requirements that pertain to your horse. National Research Council (NRC) is the best resource, but you can check out our Blog, Google, nutrition books, or ask an expert (nutritionist, veterinarian, etc). Compare the contents per dose that you calculated to the nutrient requirements you looked up just now. 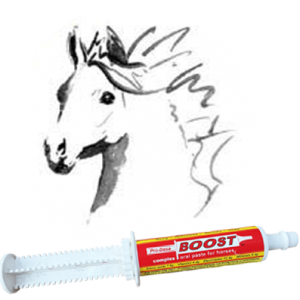 Your average horse needs about 400mg Iron per day and there is 238mg in this dose. That’s not bad. Doses of thiamine required to support nerve cell function are 1000mg upwards, so the 148mg in this fall a bit short. While that seems complicated, it is really the only way to do it. If you do it a few times and get comfortable with converting units and doing the basic mathematics, and if you have some of the basic nutrient requirements committed to memory, then you can do a rough comparison in a feed store. Most commonly, companies based in countries that use the metric system list their contents in mg/kg. Divide the contents by 1000 to get to mg/g and multiply by the dose. For example, we will use a dose of 50g, As there are 1000 grams in a kilogram, then your 50mL dose has about 1/20th of the contents on the label (50/1000 is about 1/20th). You can just divide the quantity on the label by 20 to get a rough idea of what is in a dose and then compare that to what you remember of the requirements. 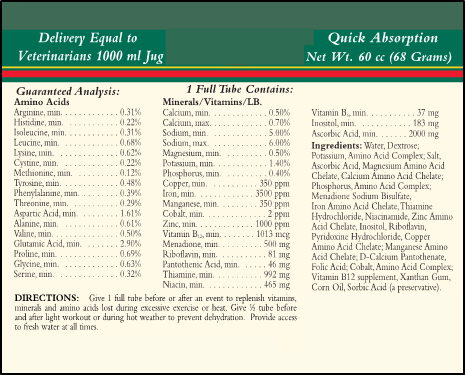 If the label is more complicated, then I do the calculations for one nutrient and then figure out what to multiply or divide the label quantities by to get what is in a dose. Then I apply that factor to all of the nutrients. Easy! In our example, nutrients listed as percentages can be multiplied by 680. In your spread sheet, you can multiply the column of percentages by 680 and the results are half done. In general, divide nutrients listed in ppm by 1000 and then multiply by the dose in grams. In our example, the nutrients listed as ppm can be divided by 1000 and multiplied by 68…or just multiply by .068. (68 divided by 1000). The nutrients listed as mg/lb can be multiplied by the dose and 2.2 and then divided by 1000 or just multiplied by 0.15. The hard part is done. You can now easily compare the quantities in any product with nutrient requirements and see for yourself if each product in questions measures up and which ones looks to be the best. To really make a fair comparison, though, you will still have to learn something about what nutrients to look for and why they must be in optimal doses; neither too much nor too little. Next, you must consider the composition and balance of nutrients in the product, so once you have recovered from the mathematical ordeal, make sure you read Part 2 of our Reading Labels series.